Tucked away in Belgravia, a short walk from the chaos of Victoria’s bustling coach and railway stations, you’ll find Ebury Street, the southern end of which is home to a little corner of London that will be forever associated with one of the world’s greatest composers: Wolfgang Amadeus Mozart. Wolfgang Amadeus Mozart (portrait by Johann Nepomuk della Croce, 1780). 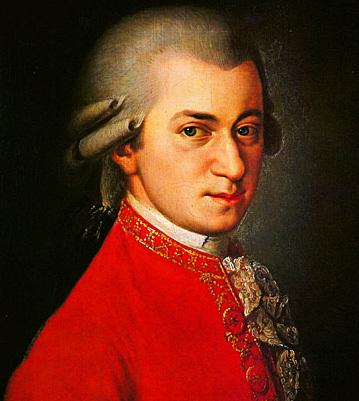 Born in Salzburg, Austria on 27th January 1756, Mozart was the youngest of seven children; five of whom died in infancy. As a toddler, young Amadeus displayed a keen interest in the violin and the clavier (a keyboard instrument similar to a piano); a fascination which was actively encouraged by his father, Leopold who himself was an accomplished composer and music teacher. 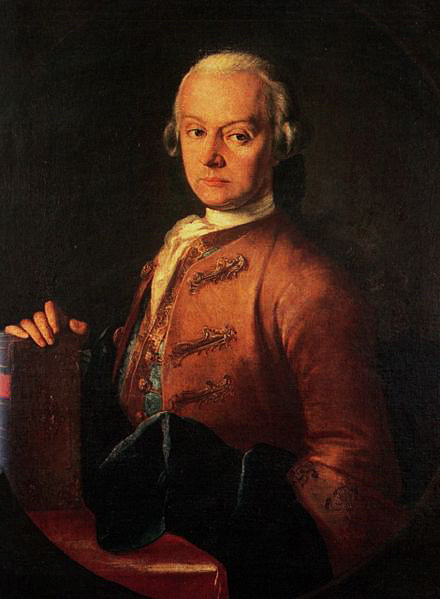 Leopold Mozart (portrait by Pietro Antonio Lorenzoni, 1765). Amadeus’ older sister, Maria Anna (affectionately known as Nannerl) also displayed impressive musical flair, her talent idolising her in the eyes of her little brother. Maria Anna Mozart (portrait by Pietro Antonio Lorenzoni, 1763). 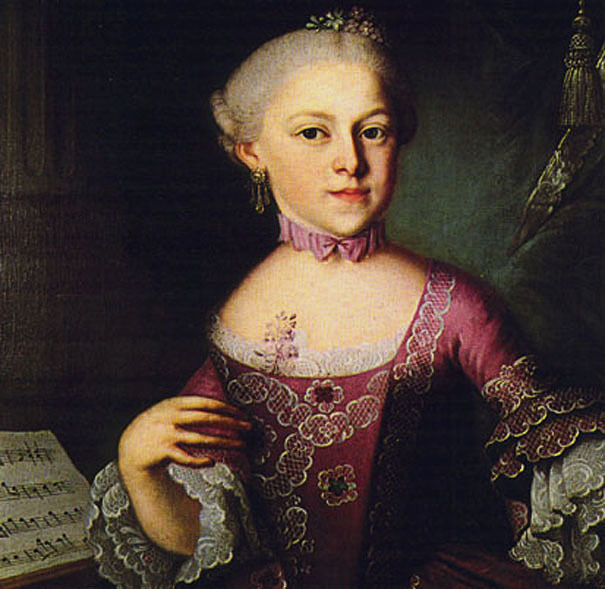 In 1762 when Amadeus was aged 8 and Nannerl 11, their parents decided to take the child prodigies on a grand tour of Europe to showcase their skills amongst the continent’s greatest cities including Vienna, Prague, Munich, Zurich and Paris. 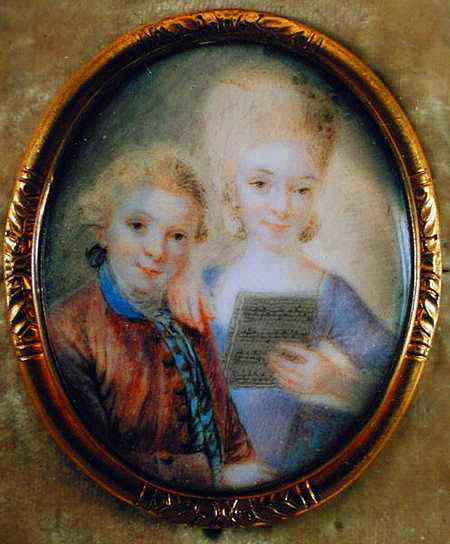 Miniature of Amadeus and Nannerl by Eusebius Johann Alphen, 1763. In April 1764 the Mozarts arrived in London where they would remain until July the following year. After a rough sea crossing and a brief stay in Piccadilly’s White Bear Inn (now the site of the Criterion Restaurant), the Mozarts found their first London digs at number 9 Cecil Court, a little lane connecting Charing Cross Road to St Martin’s Lane. 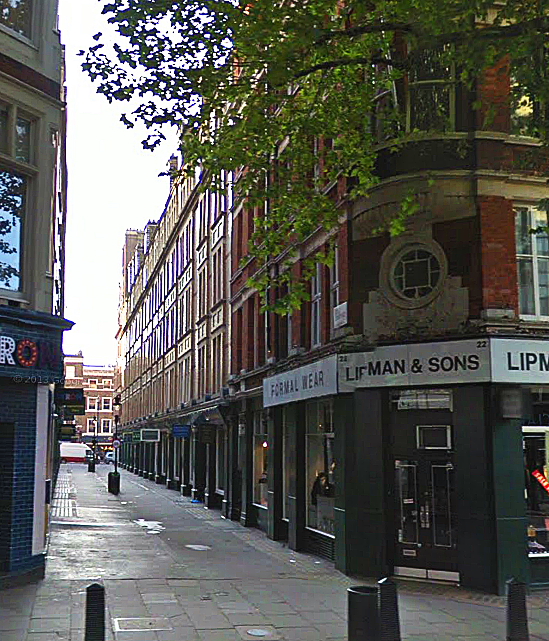 Cecil Court today (image: Google Streetview). London’s scientific community were fascinated by Amadeus’ outstanding talent and it was at Cecil Court that the youngster’s musical aptitude was closely examined by Dr Charles Burney. A report on Amadeus, compiled by the philosopher, Daines Barrington was later presented to the Royal Society. 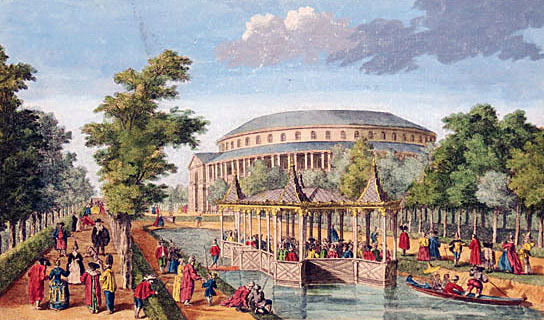 During their lengthy sojourn in the capital, Amadeus and Nannerl demonstrated their musical abilities at numerous venues; one of which was Chelsea’s Ranelagh Gardens (now famous for being home to the annual flower show). The children also played for King George III and Queen Charlotte on three separate occasions. These special performances took place in ‘Queen’s House’… the building we know today as Buckingham Palace. Amadeus and Nannerl proved very popular with the Royal couple and the King took great delight in greeting the family from his coach when he spotted them strolling through St James’s Park. 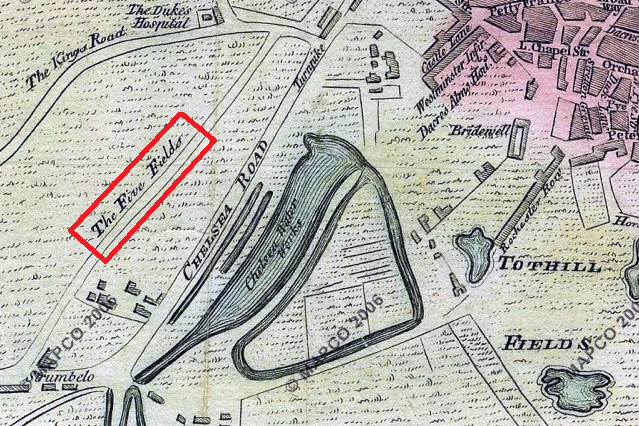 In August 1764 the Mozarts moved to Ebury Street; then known as ‘Five Fields Row’. At the time, this area was in surrounded by pleasant countryside, yet to be engulfed by the greater swell of the metropolis. Early 18th century map of ‘Five Fields’ (image: Old London Maps). It was this location’s pastoral setting which enticed the family to the area, as Leopold Mozart was suffering from a bout of illness and needed the fresh country air to help him recuperate. 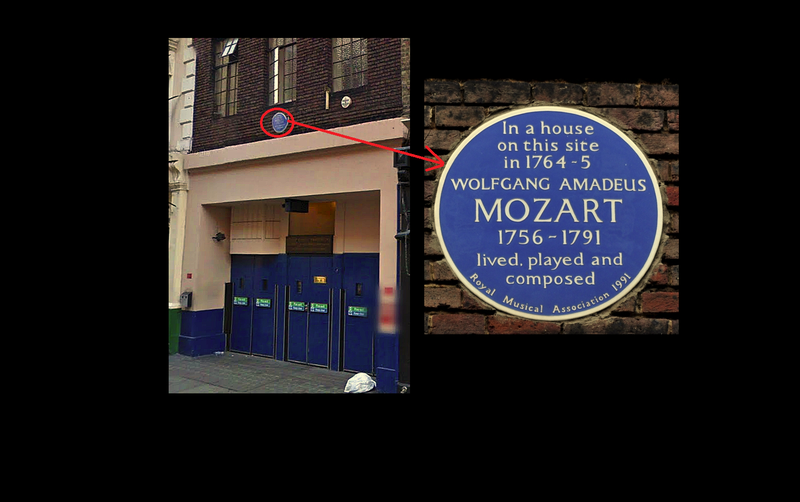 180 Ebury Street is of great importance in the life of Wolfgang Amadeus Mozart, for it was in this very building he composed his first two symphonies; an amazing feat considering he was just 8 years old at the time. 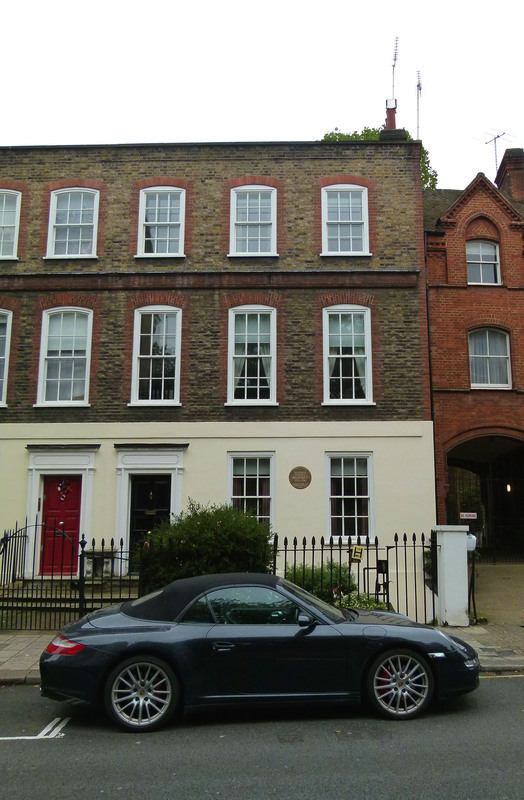 180 Ebury Street (the home with the black door was once occupied by the Mozart family). The home’s role in the history of classical music is commemorated by a plaque which was added in 1938. The row of buildings has also been christened ‘Mozart Terrace’. 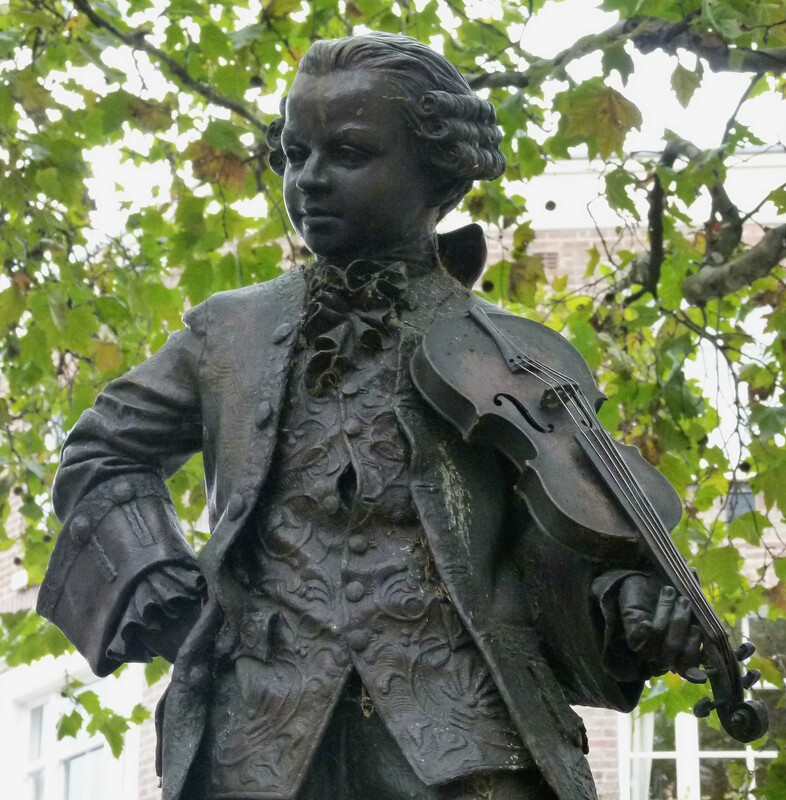 On Orange Square, which lies a few feet away on the junction of Ebury Street and Pimlico Road, a further tribute can be found; a statue of the great composer as a child. Statue of the young Mozart, Orange Square. Unveiled by Princess Margaret in 1994, this little statue was created by Philip Jackson; an acclaimed sculptor whose other pieces around London include the Ghurkha Memorial on Horseguards Avenue, artist Terence Cuneo at Waterloo Station, Bobby Moore at Wembley Stadium and the recent Bomber Command memorial in Green Park. Jackson’s sculpture of young Mozart was the culmination of a long campaign to have a memorial installed in the area- the first idea, which envisioned a fountain, was first mooted in 1961 but failed to come to fruition. 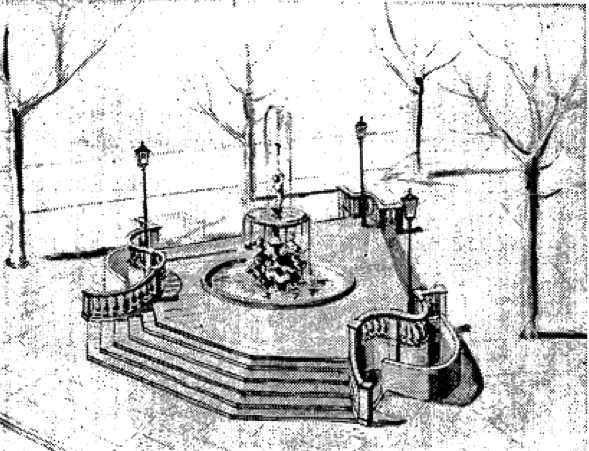 Mozart memorial proposal from 1961 (image copyright The Times). Towards the end of their time in London and with cash running short, the Mozarts found cheaper lodgings back in town at 15 Frith Street, Soho. The original building has long gone, although a blue plaque commemorates the site which is now covered by number 21. Despite the celebrated musical career which ensued in adult life, Wolfgang Amadeus Mozart never returned to London. Laden with financial woes and poor health, the genius composer died in Vienna on the 5th December 1791 aged just 35. He was buried in an unmarked grave. An excerpt from Mozart’s first symphony, written on London’s Ebury Street when he was just 8 years old, can be heard below. I enjoy this blog so much. Thank you!